New regulations concerning hazardous waste management have prompted organisations to sit up and take responsibility for disposing of their ‘special’ waste appropriately. Waste becomes hazardous when it contains elements that could be harmful to our health or to the environment either immediately or over an extended period of time. Such waste includes anything that is toxic, radioactive, explosive, flammable, corrosive or eco toxic, such as chemicals, pesticides, oils, solvents, paints and aerosols. Hazardous waste was officially known as ‘special waste’ until new regulations concerning its management were introduced in July 2005. The introduction of new controls on hazardous waste has resulted in the largest changes to hazardous waste management and disposal in more than 30 years. New waste definitions, re-branding of previously non ‘special’ wastes and an adoption of more rigorous waste acceptance criteria, have all made the issue of which waste is hazardous and how can it be disposed of, a fresh concern for the commercial sector. Waste deemed hazardous by the new hazardous waste regulations, such as fluorescent tubes and lead acid batteries. Waste not deemed hazardous, such as paper or glass. 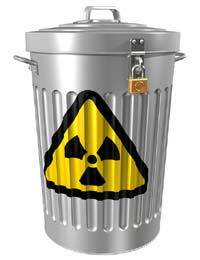 Waste that could be hazardous and so needs to be assessed. This could include paints or ink. The disposal of hazardous wastes is controlled by a number of international, national and regional regulations, non-compliance of which could lead to prosecution. The first outlines the rules of assessment whilst the second provides a list of hazardous wastes, grouped in accordance to their generic industry or process. Waste items that have been branded hazardous as part of the 2005 regulations, and must be disposed of separately, include TVs, computer monitors and fluorescent tubes. If you are still unclear, the Environment Agency, the public body responsible for protecting and improving the environment, has also published a simple and useful seven-step guide to determine for yourself what waste can go in the bin and what needs special care. Businesses that produce waste outlined in the regulations are now legally responsible their safe disposal and so are obliged to check whether their waste disposal service is registered to carry hazardous waste, or whether they must instead employ the services of a specialist contractor. As each area of hazardous waste requires its own particular expertise and equipment to dispose of it, it is rare to find an all-encompassing hazardous waste disposal company, but instead many services focusing on specific areas. For instance, PC Disposals and Maxitech can deal with your unwanted computer equipment, Action Aid will dispose of your ink and laser cartridges and Lampcare UK will take away your fluorescent tubes and sodium lamps. Advice on managing hazardous waste is available for free to all UK organisations from the government-funded business advice service Envirowise. They offer a variety of free and useful literature about waste management and have also set up a special advice line. If your office is based in Wales, Northern Ireland or Scotland then you may qualify for a free on-site visit from one of their specialist waste management advisors. This expert will help your company to identify and analyse avoidable hazardous wastes and uncover any potential financial savings.